The Bay Area has Giant Pixel and Monkey Inferno. New York has betaworks and Thirty Labs. Boston has Blade and Redstar. Los Angeles has Science. Now San Diego has Cursive Labs, a “venture studio” founded by a team of entrepreneurs who prefer to start and build their own digital technology ventures. The operational details may vary from place to place, but venture studios represent a new paradigm in the innovation ecosystem. In general, though, a venture studio operates as a kind of holding company that enables experienced entrepreneurs to pursue their own ideas and use their own resources to start and grow tech companies in-house. Established last summer by six co-founders, Cursive Labs recently closed on $2.2 million in Series A funding from Crescent Ridge Partners, Wavemaker Partners, Howard Lindzon of Social Leverage, Keshif Ventures, Bootstrap Incubation, and other Southern California investors. While such terms as “incubator,” “foundry,” and “accelerator” might seem interchangeable to many entrepreneurs, Cursive Labs co-founder Jon Belmonte said a venture studio takes a fundamentally different approach to the business of starting new companies. Where investing in the right team is often the paramount criteria for venture investors, Belmonte and Bettencourt contend that a venture studio mitigates the risk of investing in the wrong team because the same team works together on every startup. Some observers might rightly ask, “Isn’t one startup usually hard enough for even a highly talented and experienced team?” Maybe. At Cursive Labs, however, outside entrepreneurs need not apply. Belmonte and Bettencourt, who together serve as Cursive Labs’ managing directors, said their core skills are in operations—Belmonte was the former CEO and longtime COO of the Active Network and Bettencourt is a serial entrepreneur with leadership roles at San Diego’s KidZui, Blurtopia, CellarThief, and Digital Telepathy. 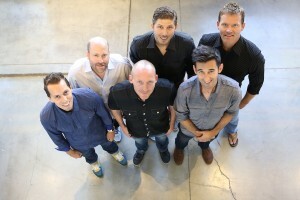 They also enlisted former colleagues Josh Schlesser, the Active Network’s former senior vice president for technology; Keiran Flanigan, a veteran mobile developer and Blurtopia co-founder; Grant Bostrom, a KidZui strategist and expert in marketing, growth hacking, and product development; and Evan Witte, a product developer on key projects at the Active Network. Cursive Labs already has two digital media companies under development: Spoutable, an advertising platform for customer websites that suggests other Web destinations as visitors exit; and Bumblecast, a marketing platform intended to help event organizers drive signups through online networking. After helping Saban Brands sell San Diego-based KidZui to children’s learning and entertainment company LeapFrog last August, Bettencourt said he had been thinking about going into venture capital. “I was really trying to figure out if it was better to join a firm or to set out on my own,” Bettencourt recalled. As he listened to entrepreneurs make their pitches to VCs, Bettencourt said he realized he was still an operator at heart. So the co-founders developed a recipe for what Belmonte calls “a highly prescriptive capital distribution” that determines within six to nine months whether a new company should be shut down—or if it has shown enough revenue and customer growth to justify putting more capital, resources, and people into the business. “What we’re trying to do is create incentives to get early wins,” Bettencourt said. Under their distribution formula, a percentage of each sale goes back to Cursive Labs to sustain its business. The rest is returned to both common and preferred shareholders. Another goal of the distribution formula is to align the interests of the common and preferred shareholders, Belmonte said. Cursive Labs plans to take the lessons from each startup effort, good or bad, and apply them in a disciplined and metric-driven process to identify new startup ideas in subsequent rounds. The entire process is intended to ensure that the team spends its time only on the projects that customers find valuable, and that reinvested proceeds enable Cursive Labs to sustain its operations. That may be easier said than done, of course. In any event, Bettencourt and Belmonte maintain that Cursive Labs’ model represents a unique approach even among venture studios. With $2.2 million in initial funding secured, investors have essentially placed their bets. Now it’s just a matter of time to see if this is a model that works. Awesome model. Another win for San Diego. Best wishes for a rousing success!